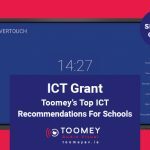 Toomey Audio Visual have been supplying schools with all types of projectors for five decades and we have learned a few things along the way. We supply every type of digital projector for every application: Portable, Installation, High Brightness, Full HD, Long Throw, Short Throw, Ultra Short throw, Classroom refresh units, IWB projectors, Large Venue and School Hall Projectors. Educational projectors are unique to all other projectors with regard to one thing: WARRANTY. Educational Projector warranties are extended (typically 5 years), so they are designed to last. Let us take you through the types of projectors one by one by one. These are typically long or standard throw units. Lighter in weight (sub 2.5kgs) and designed to be moved around from room to room or from office to office. Typically the are small light and come with a carry case. Designed to be ceiling mounted. These machines are larger in size, offer excellent image quality and more connectivity options. Installation projectors tend to be higher resolution and often offer wireless connectivity as an option. As the name suggests, they are brighter. 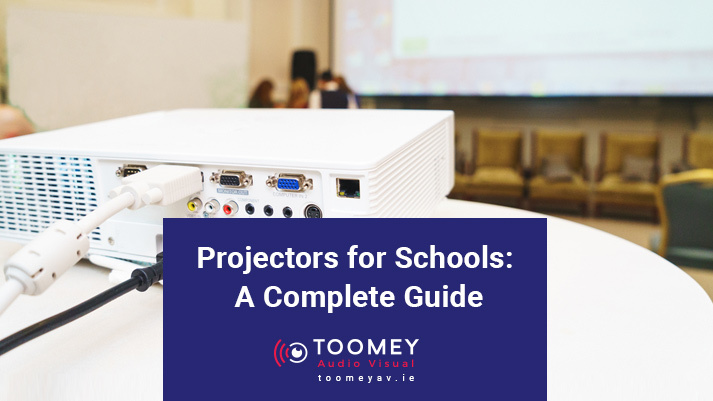 Typically used as school hall projectors, GP rooms and larger areas where people gather, the extra brightness is needed to fill large projections screens. FYI: Our most popular school hall projector bundle at present is 8500 ANSI Lumens brightness with a 3.5 Mtr. wide electric screen! Full HD projectors are higher resolution at 1920pixels x 1080pixels. They are typically used in technical rooms where for example CAD software is used i.e. wood work, metal work or in art rooms where image quality is critical. More frequently, HD projectors are used for video or film use. Classroom projectors are the hardest working piece of equipment in the school. Running anything from 6 to 16 hours a day classroom projectors must be consistent and reliable. Typical current spec is 3000 Lumens brightness, WXGA (1280 x 800) Resolution, VGA & HDMI Inputs and 5 year warranty. 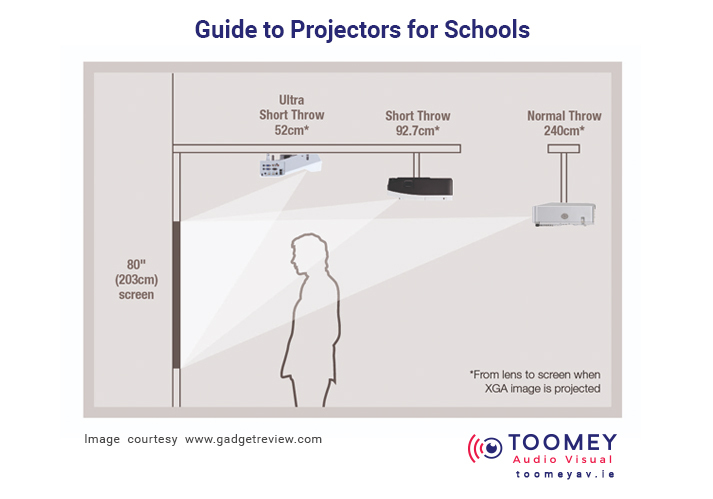 Classroom Projectors can be Long Throw, Short Throw or Ultra Short throw. The throw refers to the distance of the projector from the screen or whiteboard. Short throw and Ultra short throware the most popular. Interactive Projectors combine the display and the interactivity into one unit. The market leader is EPSON and the product is fantastic. All units are high brightness and ultra-short throw. Resolution is available right up to Full HD and both pen and finger touch interactivity is available. You can project straight onto a standard dry wipe whiteboard. 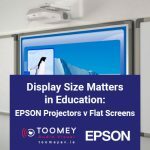 Here at Toomey Audio Visual we are not tied to any particular projector brands, so we are best placed to give you unbiased guidance on which projector best suits your needs. With each option we present you’ll get the equipment’s complete details and technical spec, as well as cost comparisons – so you’re clear what’s available, its pros and cons, and how much it will cost. Then you can present your options to the board and teaching staff, confident that you’ve considered every aspect thoroughly. 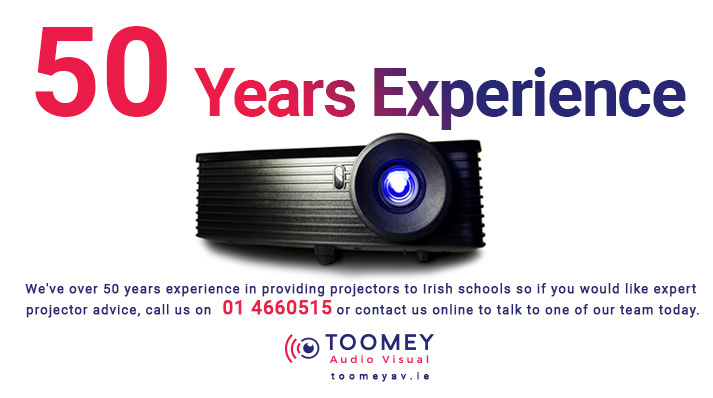 If you would like expert projector advice, call us on +353 1 4660515 or contact us online to talk to one of our team today.